The highest paid player in baseball has the last name "Rodriguez" and 3 of the top 10 highest paid players in major league baseball are black - but major league umpires are racist, argues Johan Sulaeman, a financial economist at Southern Methodist University. They looked at 3.5 million pitches from 2004 to 2008 and found that minority pitchers are so convinced white MLB umpires call strikes more often for white pitchers than for minority pitchers that they throw 'safe' pitches and therefore hurt their own performance. In other words, umpires aren't biased, but this 'study' claims minority pitchers think umpires are biased so they under-perform. It's that made-up phenomenon designed to create a racist environment even where none exists; stereotype threat. How did an analysis of 3.5 million pitches determine that? It didn't, it's an intellectual headfake designed to take a cultural position as fact and massage data to fit. The justification is a previous shaky study that alleged umpires called strikes more often for those in their same ethnic group - even if a video looked like a ball to some. Ignored in the data; every pitcher knows every umpire has their own strike zone, no umpire actually calls the strike zone in the rule book. If they did, every pitcher would have 300 strikeouts per season and the batting average would be south of .200. "In MLB, as in so many other fields of endeavor, power belongs disproportionately to members of the majority — white — group," the authors write. Baseball parks are monitored by QuesTec now but during the period covered, 2004-2008, only about one third were. Four cameras recorded the location of each pitch, MLB decided to consider an ump's performance sub-standard if more than 10 percent of his calls differed from QuesTec. Did the researchers consider that umpires would be 'tight' knowing a brand new technology was determining their job security in those early days? After all, both umpires and pitchers were aware that QuesTec was the new mechanism for gauging umpire performance - but pitchers did not have a machine second-guessing their location. No, anxiety only happens to minorities, not white people, so instead their conclusion was that a minority pitcher is more likely to throw the ball right down the middle of the plate and get hammered due to implied racism. 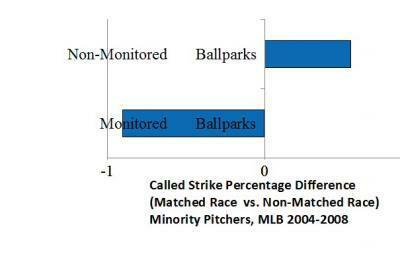 (1) It assumes umpires are biased against minority pitchers but not minority batters. (2) It drew a completely specious correlation based on 66% of the pitches without knowing if the pitches were strikes or not; they simply logged whether they were called strikes. The QuesTec results were not available for 2/3rds of the pitches that determined their conclusion. (3) To help control for their results, they factored in a nebulous 'importance of the at-bat' scoring method. (4) They considered the racial demographics of the neighborhood around the ballpark to be valid determinants for whether or not an umpire was making correct calls. By comparing only pitchers, where only 30% are minorities, to umpires, where only 10% are minorities, they set an irrational comparison but then declare it meaningful. 20% difference in race is a lot but they claim since 89% of umpires are white, and 70% of pitchers are white, all of the white pitchers are getting some exceptional break but no penalty is occurring for minorities, since their claim is umpires only give positive results to same-ethnicity pitchers - the poor performance claim is because minority pitchers believe white umpires are biased so they throw worse pitchers and get lit up more, not that the umpires are biased. They also claim that if attendance is low umpires will call more strikes for same-race pitchers. How can they know that? Well, they can't. Economists don't do science, they take the past and try to make it look like there is a method for the future. If Paul Krugman wrote this study, he would correlate how many Republicans kept their teams from winning important games just by being Republican. The worst claim was that their was bias 'on the edge' of the strike zone but not when it was clearly a ball or a strike. This leads to obvious questions, the most important being; in baseball, the most statistically analyzed sport in the world, if these results are true, why has no one noticed and started optimizing their lineup around the umpires? In any home stand the manager knows exactly who will be behind the plate. Why wouldn't he put a white pitcher out there, the same way he would a lefty-righty match-up. Yet it hasn't happened even once that a manager stacked his match-ups on race, even though the claims in these numbers is that the racism is obvious. The second question is why hasn't this had a substantial outcome in results? They claim there might be some "indirect influence" - which is as rigorous a conclusion as just making something up - implying that a $50,000 difference in average salary (out of nearly $5 million) for non-whites is evidence of lower performance due to concerns about racist umpiring, but there is no pay scale for players at the high end. Baseball has primarily small-market teams so if more of the openings during the few years they analyzed were in Pittsburgh and Oakland then anyone of any race signing during that time was making less money.